One spring day in 1992, Stephanie Jutt and Jeffrey Sykes asked each other over lunch, “What are you doing this summer?” “Not enough playing,” they both agreed. So they set about creating a new chamber music series in Madison. They wanted to play great music with great players. They wanted music hot off the press mixed with the classics. A touch of theater. Artistic challenge. An engaged audience. Fun. They also knew the name they wanted for their festival…. 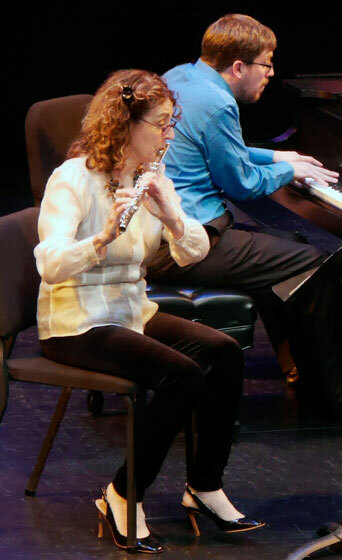 Some years ago Stephanie had played in a jazz and classical music series in Half Moon Bay, California, that had been christened the “Bach Dancing and Dynamite Society” after audience members on one memorable evening were inspired to dance on the beach to Bach’s Brandenburg Concertos and set off fireworks after the performance. With a blessing from California, Stephanie and Jeffrey borrowed the name and determined to recreate the spirit of spontaneous fun and the incredible music that made you want to dance. Stephanie and Jeffrey then wooed four musician friends with their vision (and with margaritas, frozen custard, and lunches at their favorite restaurant), and all agreed to perform for free. The Madison Civic Center provided performance space and publicity for two free concerts. And crowds turned out for their first experience of BDDS’s “serious fun.” Each night more than 200 people packed the room, and dozens more stood outside the doors listening in. Stephanie and Jeffrey placed an open cello case near the exit and made a plea for spare change. That “spare change” added up to more than $1,500 on those hot summer evenings. With that nest egg and with help from a growing group of fans, they have made their artistic vision a reality. BDDS is now in its third decade. It has become abundantly clear that our vision has been enhanced by those who have invested their wisdom and talent in extraordinary measures. In 2001 we inaugurated our Big Bang award to honor such people. We thank those whose spirits have not only sustained ours but have expanded our gratitude to bursting.